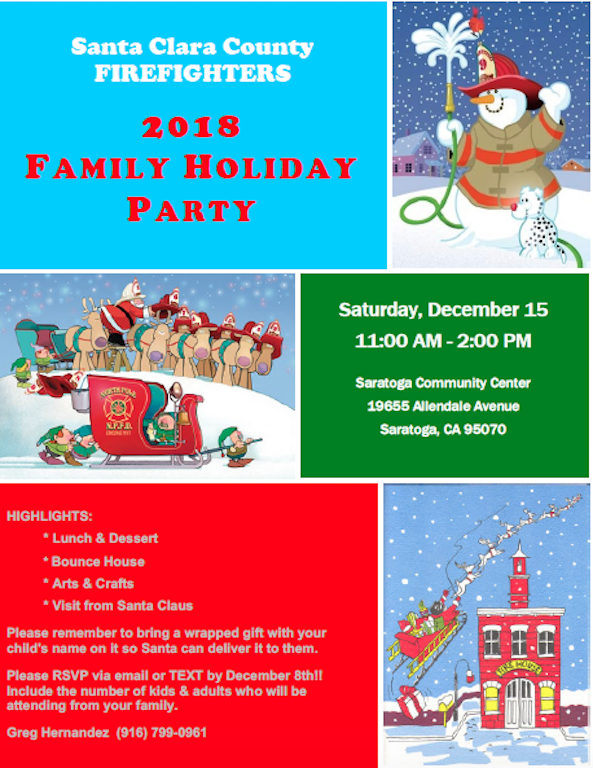 On behalf of the Santa Clara County Firefighters Executive Board, I would like to invite you to our 2018 Family Holiday Party. All SCCFD employees are welcome to attend. We will be gathering to celebrate the holidays and provide an opportunity for our families to mingle and get to know each other more. Lunch and dessert will be provided, so you just need to show up with your loved ones and enjoy yourselves. It will be held on an C-shift day, but your family is encouraged to attend even if you are on-duty that day. In addition, you are encouraged to attend even if you don't have kids. It will be a fun time to relax and enjoy some food with your co-workers...off-duty. There will be a visit from 'Santa' and he will be handing out gifts (provided by you). If you want to participate, please bring a wrapped gift with your child's name on it. We will have a collection bag for gifts when you arrive. If you can't sneak the gift(s) in with your kids present, we will have someone available to provide assistance and/or distractions so it can be retrieved from your car. I have attached a informational flyer for the event to this email. Copies of the flyer will be placed in the pony mail for each station, so they should be arriving at your station soon. Please post them when you receive them. **I am still looking for folks to assist with set-up (10:00 - 11:00 am) and clean-up (2:00 - 2:30 pm). We definitely need many hands both before and after to pull this off, so please contact me if you can help with either or both. We are looking forward to a fun afternoon with all of our Local 1165 families. Feel free to contact me if you have any questions.